Shipping is a perpetual and the most stressful part of the online shopping experience as your customer has already paid a product but still hasn't received it. The Mobile Order Tracking extension introduces a simple way to check the order processing and delivery status in real-time, thus alleviating customers' concerns. Such transparency is not just a convenience factor, but a contribution to the overall store credibility and customers' trust. This Magento order tracking extension grants instant access to order details, and moreover, it introduces direct Magento shipping tracking functionality - a simple improvement that gives a huge boost to site usability. A protected link included in the order confirmation emails will take your customers directly to the tracking page, bypassing the login. 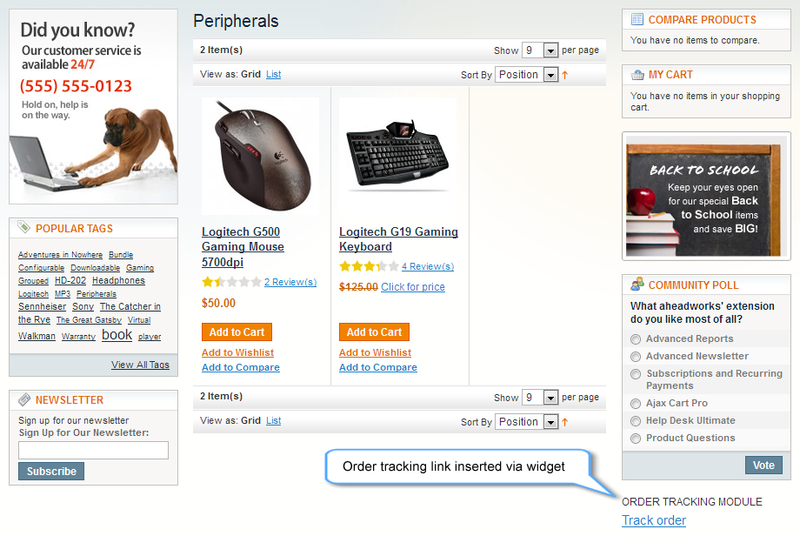 The tracking page shows the actual Magento order status and the shipping progress. 100% convenience, 100% security. The tracking page is optimized to work with mobile devices, making it easy to check the shipment on-the-go. The Mobile Order Tracking Magento extension is compatible with the most popular mobile operating systems for smart phones: iOS, Android OS, BlackBerry OS, and Windows Phone 7. 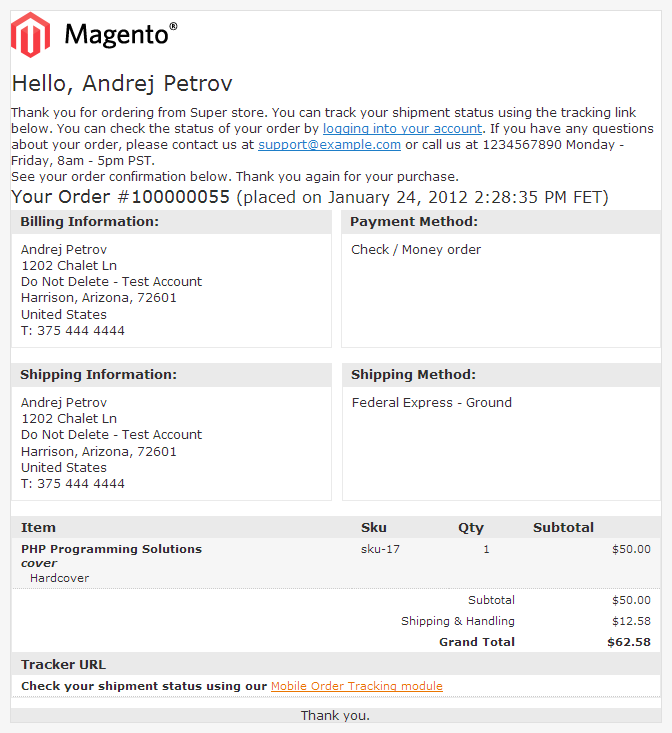 The extension embeds the Shipment tracking into the your Magento store. Your customers won't have to memorize the tracking codes and navigate to external shipment / postal tracker sites any more. A link to the on-site tracker can be inserted into virtually any store area via a simple widget. The on-site tracking is available for both unregistered and logged-in customers. A guest will just need to supply the Order ID and Email address, while a logged-in user will have a convenient orders selector. Gr8 module & superb support. Simple and ridiculous it's missing from core. Thumbs up! Probably the best Extension AW offers! Not sure why only 7 reviews because this is simply brilliant extension that goes right to the tracking of all your shippers. It make your site look like the big boys like Amazon and the mobile version shows up perfect on your cell phone. The one glaring mistake AW made with this is that they included the link for tracking in Admin yet forgot to put these links in the customers account dashboard and order page. I just had my developer add these to these sections so customers can not easily click on their tracking and get a live update. I think this is one of those "must-have" extensions! Before using Mobile Order by aheadWorks I occasionally had complaints from customers that they had trouble tracking their orders. Some orders would take a bit longer than arrive than they expected, and it was difficult for either my customers or my support team to locate it. However, this simple extension has made this problem a thing of the past, and one of the great things about it is that it works on a number of different platforms. After appearing of this service on my store I get positive feedback from my customers. They are happy that shipment and payment statuses can be tracked from mobile phones. It's convinient and efficient. Thanks. This extension is easy for customers to use and works very well. It displays well on the computer as well as on mobile devices. Really a simple extension, but i see customers using it all the time to track there order via our live chat tracking system. A+! Simple effective extension that really should be part of the core. Wonderful product ! We were waiting for such a solution ! What a wonderful way to reduce our Customer Support Calls and Emails regarding Shipping/Deliveries etc. Awesome product by Aheadworks ! We love it. 1 ) ability to send out SMS alerts / email ALERTS when the product is delivered and so on. Anyways we are very happy and satisfied with the product so far.